Whether for good, bad, or somewhere in between, our families shape us all decisively. We cannot tell the story of our lives without them. So many of our traits, quirks, and other characteristics reflect those who raised us and those who raised them. Though we are free to make our own choices in how we live our lives, we cannot pretend that it all started with us. There is always a back-story or a prequel about those who went before. The Old Testament certainly provides a realistic account of the importance of family life in human history, as most of it concerns the many generations of the offspring of Abraham and Sarah. So it is not surprising that Matthew begins his account of the good news of Jesus Christ with the family tree of the Lord, with His genealogy. He does so in order to show that He had the right heritage to become the Messiah, the anointed One in Whom all God’s promises to Abraham would be fulfilled. So Matthew traces the Lord’s ancestry back to Abraham; through David, the great king who was viewed as a model for the Messiah; and through all the generations up to Joseph, to whom the Virgin Mary was betrothed when she became the Theotokos, the one who carried the eternal Son of God in her womb and gave birth to Him in a cave used as a barn. We usually tend to rush through genealogies in the Bible, for we think of them of them as unimportant lists of who begat whom. But we will miss the point entirely if we pass over Matthew’s account of Jesus Christ’s family tree so quickly, for it is not what we would expect. It contains surprises that prepare us for a Messiah quite different from the conquering hero most of the Jews expected. They wanted a new King David to defeat the Romans and make their nation strong and free. Some, like the Pharisees, hoped for a Messiah to interpret the Old Testament law strictly and to bring blessing upon the righteous and condemnation upon the sinners, including Gentiles and also Jews who did not obey the law. We would imagine that such a messiah would come from the most righteous and upstanding family imaginable, from one above suspicion or embarrassment of any kind. But a careful reader of Matthew’s genealogy will notice the unexpected presence of women in what was conventionally a listing of fathers and sons. Tamar, Rahab, Ruth, and the wife of Uriah, Bathsheba, stick out like sore thumbs. In addition to being women, they were Gentiles and involved in scandalous relations with Jewish men. Tamar dressed as a prostitute and gave birth to the children of her father-in-law. Rahab, who hid the Hebrew spies in her home in Jericho, was a prostitute. 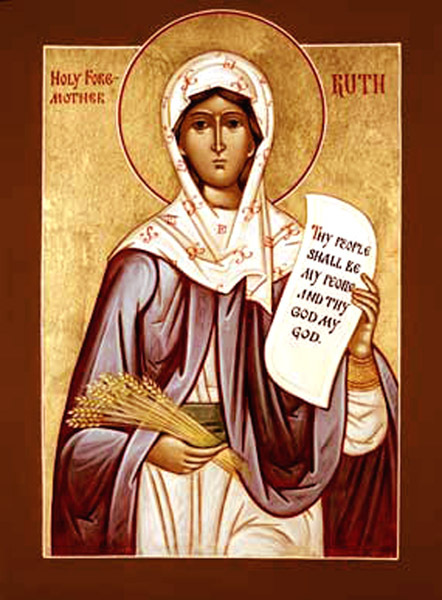 Ruth was King David’s great-grandmother and a Moabite woman. The Old Testament repeatedly warned Jewish men not to marry Gentile women like Ruth. King David committed adultery with Bathsheba and then murdered her husband. Let us be honest. We would never draw attention to such scandalous stories in our own families. Just imagine how shocking these figures were in the genealogy of the Messiah, especially for those who thought in legalistic or nationalistic terms. Jesus Christ was a very different kind of Savior than what was commonly expected in that time and place. This unlikely cast of characters reminds us that God’s promises are not only for righteous Jews, but for everyone with faith, including foreigners and strangers, repentant sinners, and those whose lives and families are profoundly broken. Matthew introduces us through the genealogy to an unusual Messiah Who blesses the humble, the outcasts, the hated foreigners, and those who genuinely hunger and thirst for righteousness. He came to call not the righteous, but sinners, to repentance and was not afraid to speak harshly to the Pharisees and others who trusted only in themselves. Right after the genealogy, Matthew describes the Lord’s birth under circumstances apparently even more scandalous than those we have described so far. A virgin girl becomes pregnant by the Holy Spirit. Her elderly guardian and protector Joseph was horrified by what he assumed was her immoral behavior, and was ready to end their betrothal. But he believed when an angel told him of the miracle of the Child’s conception, and old Joseph became the adopted father of the Lord. The Christmas story is so familiar to us that we tend to ignore how shocking, embarrassing, and unconventional our Lord’s conception and birth were. Many probably judged the Theotokos and St. Joseph and refused to believe. It could not have been easy for the young girl or the old man to change the course of their lives, and to put their reputations and physical safety at risk, in order to play their unique roles in the coming of the Savior. And when we remember that this is the story of the union in Jesus Christ of God and humanity, of the fulfillment of all God’s promises beyond even the greatest expectations of the Old Testament prophets, of the Incarnation of the Son of God for our salvation, it becomes even more shocking. For we usually expect that God’s ways are like our ways, that His kingdom is like the kingdoms of earth, that He must love the respectable, wealthy, and successful more than He does the scandalous, the poor, and the downtrodden. We usually think that holiness is pleasant, respectable, and for people with whom we are comfortable, not embarrassing and scandalous. Today’s gospel texts call us to accept that the mystery of our salvation in Jesus Christ is not an extension of the accomplishments of our families or of our own virtues or abilities. It is not a reward or a punishment for anything that we have done or refrained from doing. It is not about the politics, culture, or the strength of any nation, party, or group, whether past or present. Instead, it is simply the fulfillment of God’s promises to Abraham, now extended to all who have faith in the true Messiah, the One who is anointed to bring light and life to the world, to be the second Adam in Whom our fallen, corrupt humanity is brought into the very life of the Holy Trinity. Those promises were not fulfilled in the lifetimes of even the most righteous people of the Old Testament. As today’s epistle reading states, “since God had foreseen something better for us, that apart from us they should not be made perfect.” As hard as it is to believe, we are all grafted into the family tree of the Messiah by faith. He is the vine and we are the branches. With all our sins and brokenness, we are unworthy and unlikely members of such a glorious family. Like those who prepared for the coming of Christ and those who have served Him since, we are also scandalous sinners—even if we have learned how to hide the shocking details from other people. Perhaps that is why the Son of God chose a family full of imperfect people who so often got it wrong; perhaps that is why He was born in miserable circumstances unfit for any human being, much less the Messiah; perhaps that is why the Old and New Testaments do not even try to conceal the sins of both the Jews and the early Christians. The Lord’s genealogy contains a lot of people who are a lot like us, for that is who He came to save. In the coming days before Christmas, let us prepare to embrace more fully the promises made to Abraham and fulfilled in our Lord, God, and Savior Jesus Christ. He comes to make us—with all of our outrageous problems and imperfections– members of own His family. Our inclusion is part of the perfection of that ancient heritage of faith and expectation. So let us kneel before Him in humility this Christmas with a profound sense of gratitude and joy. And let us never, ever give up in believing that His mercy extends to people like you, me, and the members of our less than perfect families. That is precisely whom He came to save.